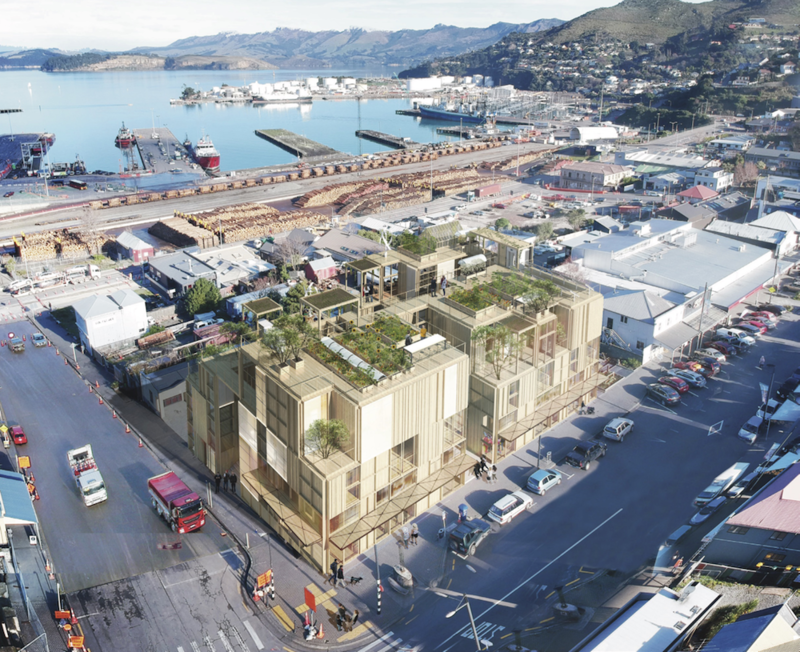 A team of cross-practice Cantabrian architects, In:Flux, took out the public vote for their design of The Hive at Collett’s Corner, a prominent site on Lyttelton’s main street. Developers OHU Development worked ‘with the local community to inform the uses’ of a multi-purpose building before putting a call out for innovative designs, which needed to incorporate a public bathing area, residential or hotel areas, a cinema, and co-working, event and retail spaces. Thirty-one designs were then whittled down to three finalists, before The Hive was chosen to become what will be one of Lyttelton’s most striking buildings. The project is underpinned by collaborative design and community engagement principles. As reported on Stuff last week, OHU Development is going one step further – Collett’s Corner will also be collectively owned by the community it supports (community members can buy a share for as little as $100). It is a model soon to be applied in the arts as OHU is also looking to build New Zealand’s first mixed-use and community-owned “co-living, co-working facility to strengthen communities’ creative and cultural sector”. In:Flux: The Hive. Photo supplied. After repeated delays over the decision as to which theatre proposal would be the first to be built in Christchurch’s Performing Arts Precinct, one could almost read disbelief into the RNZ headline: “Revived Andromeda Theatre to be built in weeks”. This pop-up facility was named after the proposed permanent $19 million multi-use theatre, Andromeda, which was up against the Court Theatre’s $45 million proposal. The Christchurch City Council chose to put its 30 million eggs into the latter’s basket, as Charlie Gates covered in The Press earlier in the year. Little Andromeda’s programme, which launched last week – features a diverse range of performance arts. Pending resource consent, Little Andromeda kicks off October 4 in a 300-seat tent on a vacant site and will operate as a joint venture with the artists. It aims to make “performing space, promotion, and ticketing more accessible”, as reported on Newsline, and bring a diverse range of people into the city. Tempo Dance Festival, “New Zealand’s only comprehensive dance festival” is gearing up for 11 days of events running from October 3 in Auckland. Showcasing work by New Zealand and international artists (LA Contemporary Dance Company among them), some of the highlights include Deep Soulful Sweats, a participatory “energetic astro-dance party”; Kotahi, a cross-cultural collaboration exploring new futures for indigenous “contemporary dance making”; and HEALR by– Soft Co, reviewed by the NZ Herald in its initial run as “an intriguing exploration of the concept of wellbeing”. Bianca Hislop: Kotahi. Photo by Charles Howells. Festivals don’t just get people out and about; their impacts can extend beyond their duration. The Auckland Writers Festival launched its Mātātuhi Foundation on 18 September, a foundation created to “support the development of the literary landscape in New Zealand”, according to its website. It will award up to ten one-off grants of $2000-$5000 each year towards projects and activities that “provide opportunities for New Zealand writers to develop and promote their works and for readers to increase their appreciation of New Zealand literature”. The foundation invites expressions of interests twice a year, with deadlines on 31 October and 31 May. Meanwhile, check out TBI’s interview with the new director of the Christchurch Arts Festival, George Parker, here; and – speaking of Christchurch architecture - creative director Barnaby Bennett on FESTA, here, and the FESTA programme, just launched, here. To mark 125 years of suffrage, the NZ Herald is running a series of articles – 125 in all – on trailblazing women. Women in the arts feature prominently and range from New Zealand’s first professional photographer Elizabeth Pulman through to Louise Tu’u (first New Zealander to be awarded the Royal Court Theatre residency in London) and Lorde. In other suffrage reading, The Ministry of Culture and Heritage has announced twenty-five new entries to its Dictionary of New Zealand Biography, that “draw on diverse strands of women’s experiences”. When Fairfax went to tabloid format, arts coverage and reviews were dramatically cut. Although it plays an important role, online reviewing cannot replace printed reviews and the reach of major newspapers, as this Standing Room Only segment explored (with interviews by The Lowdown’s own Mark Amery). Come October 1st, Dr Warren Feeney, arts writer and consultant, will be launching a monthly arts newspaper, Art Beat. Featuring news, reviews, commentary and a comprehensive listing of events, exhibitions and workshops in the visual arts taking place throughout Christchurch and Canterbury, it will be distributed in galleries, libraries, retail outlets and even delivered to 6000 homes a month (a website is also set to launch October 2). On the cover of the first issue: Chris Ulutupu’s work, presented for SCAPE Public Art, which opens October 5 in Christchurch. 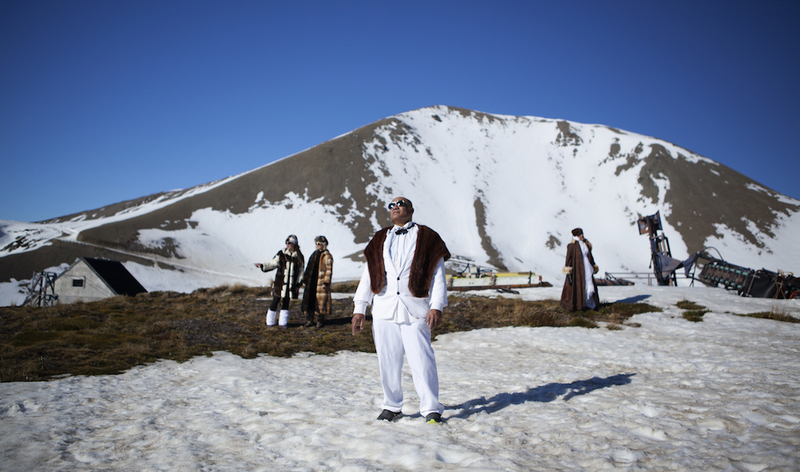 Chris Ulutupu, WinterSCAPE, deconstructs a 1977 Winter Vogue photo-shoot in the Mount Lyford Ski resort area. Presented for SCAPE Season 2018. Image courtesy of the artist and SCAPE Public Art. Extended Conversations, a programme for emerging art writers that explores art writing as a critical activity, has gone live with its first texts. The programme, which has been developed in response to Aotearoa’s particular artistic context, entails mentors (Matariki Williams and Jan Bryant among them), intensive workshops and online publishing. The resultant first works by Jessica Aitken, Simon Gennard, Dilohanna Lekamge, Francis McWhannell, Hanahiva Rose and Amy Weng are now available. Amy Weng is also a past organiser of the Asian Aotearoa Arts Hui, which wound up its 2018 programme on 23 September in Wellington. This three-week long celebration of Asian New Zealand creative arts supports Asian New Zealand practitioners ‘through presenting practice, sharing ideas and networking’. Listen to podcasts from the AAAH here. For more background on the drivers behind AAAH, and how it has evolved, read this round table discussion between past and present organisers. Among those featured in this year’s programme was Yuk King Tan, the New Zealand and Hong Kong based contemporary artist, who is currently installing her work The New Temple - I give so that you may give, I give so that you may go and stay away at Te Papa. She writes about her “art inspiration” for ARTicle Magazine here. Liam McIlvanney, the New Zealand based academic and writer, wins the Scottish Crime Fiction award named after his grandfather, William McIlvanney, with his novel The Quaker. Miranda Harcourt, actress and director, won the 2018 Westpac NZ Women of Influence Award for Arts and Culture, while The Alexander Turnbull Library has acquired the archive of art dealer Peter McLeavey. Nic Lowe has been awarded the CLNZ Writers’ Award and a cool $25,000 for his project Uprising, which explores the contested significance of the Southern Alps through a Ngāi Tahu lens. Four CLNZ/NZSA research grants – $5000 a pop – were awarded to journalist Philip Matthews, writer Pip Desmond, historian Jock Phillips and scientist Dr Mickie Dickinson.